Are you ready for this year's Midwest Foodservice Expo? Make sure to add this event to your calendar now! This year’s event takes place March 11-13, 2019 at the Wisconsin Center in downtown Milwaukee. The Wisconsin Bakers Association is proud to partner with the Wisconsin Restaurant Association once again, bringing an incredible line-up of bakery and decorating competitions and hands-on demonstrations! If you've attended Expo in the past and don’t think you will miss anything this year, think again! Not only is this event a great chance to network with your fellow WBA members and other industry contacts, but it’s a chance to take part in seminars, learn some new skills, and compete to be the best in the industry! And, don’t forget about our Annual WBA Awards & Appetizers Networking Evening on Monday night! Sign up to compete in this year's Baking & Cake Decorating Competitions at the Midwest Foodservice Expo! Students, Beginners, and Advanced Professionals are invited to compete in the Extreme Wedding Cake Challenge, Creative Cake Decorating Competition, Best of the Midwest Pie Contest, and NEW IN 2019: Extreme Birthday Cake Challenge, Decorated Cut-Out Cookie Contest, and Wisconsin's Top Cupcake! Advanced Professionals are also invited to compete in Wisconsin’s Ultimate Donut Duel and BACK BY POPULAR DEMAND the Baker's Best Kringle Contest and NEW IN 2019: Clash of the Cake Artists! For rules and information, please click on the name of the contest below. *High School students entering a competition must be currently employed by a licensed food service facility (bakeries, cafes, grocery stores, restaurants) at the time of the competition. 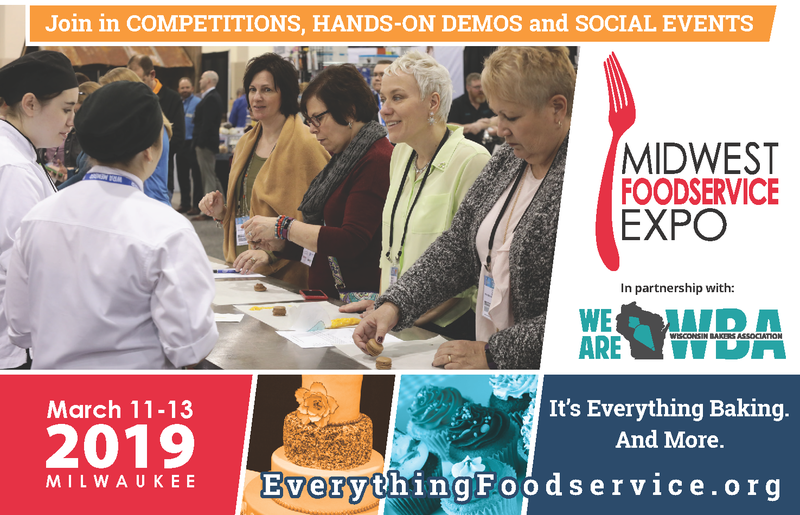 All entries will be professionally judged at the 2019 Midwest Foodservice Expo. Admission to the Midwest Foodservice Expo is included with registration for each competitor. The early registration deadline for all of the competitions is Friday, February 15, 2019. The standard registration deadline is Friday, March 1, 2019. All entries must be registered in advance. Early registration allows WBA Members to take advantage of the lowest entry fees - starting at $30! ** No competition entries will be accepted onsite. Registration fees are non-refundable. Except for the Clash of the Cake Artist competition, winners will be announced at the Awards & Appetizers Networking Evening. A discounted ticket option to WBA's Awards & Appetizers event is available to competitors. People’s Choice will be announced at 2:00 PM on Wednesday, March 13th in the competition area. Be sure to sign up today for this year’s Midwest Foodservice Expo! There will be so much going on over the three days! For more information about MFE, visit www.everythingfoodservice.com. **Membership level must be Academic, Associate, Professional, or Premier Professional. $30 entry fee does not include admission to awards night.